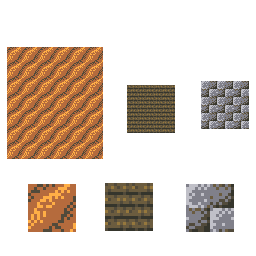 First few textures from a novice pixel-artist. My sand looks great from afar, but crappy as heck up close. Is that normal? I will definitely be fixing stone brick. 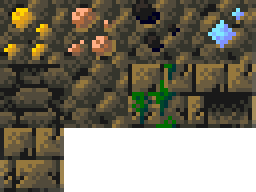 First is sand, second is some wood-related block (not sure which yet), third is temporary stone brick. Not bad for someone who doesn't normally do pixel art. However, your stone brick and mysterious wood block should have defined outlines since they're man-made blocks that are pieced together rather than natural ones. As for the sand, I think the problem might be that you've sort of just added random noise. It should be dithered in some way or other, even just having a few lumps of one colour inside another ones looks good. Left to right, top to bottom: Wool, planks (birch, oak, spruce, acacia, jungle, dark oak), birck log, stone bricks (normal, mossy, cracked, chiselled). I may make more random CTM varients for the chiselled stone brick. That orange-to-grey colour ramp is very useful. Wait, someone's actually using my palette? However, you might want to re-copy the palette, since I made a slight change to the pale brown colours. Um, no, I'm not using yours, I'm using the palette of the actual challenge. I really like the stone brick! So I finished the swords,picks, and shovels.All the tools have a theme:Wood = Natural with vines and stuff.Stone = Round and smooth stones.Iron = Based off of default.Diamond = Larger.Golder = Thinner.Heres a preview: Edit:Bigger preview. Thoughts? The Smash 4 hype train has no time for petty little wriststraps. The ores need a bit more embedding. Right now they look kind of pasted on. So I redid the ores and started on bricks. Any thoughts? Beautiful! That missing brick probably causes serious tiling issues, though. Looks fairly good,if your going for a realistic style,I'm going for cartoony. I believe that they look very nice! Good job. :DNot that I am actually entering, but I thought I'd share my own attempts of my palette with you guys! I have an issue with the fact that people are strictly following the colour ramps. This is a challenge, the colours are bright and not-so-amazing, get some creativity with the colours. Bluberry, for instance, has too saturated colours for stone. Dragonoid's stone matches the wood colours. Unrelated to previous note, Sam, you should make the moss go up a bit. It looks like it's coming from behind the top brick and hanging over the bottom one, which looks quite offputting. I believe that they look very nice! Good job. Not that I am actually entering, but I thought I'd share my own attempts of my palette with you guys! 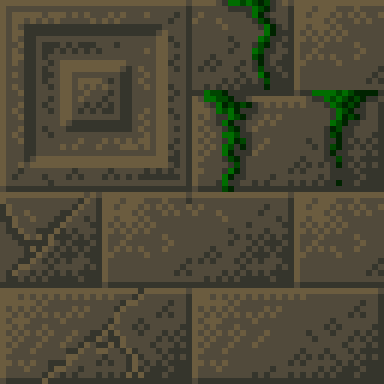 Stone Bricks(x4): -snip- Thoughts? The shading looks a bit unusual on the chiselled stone brick, but other than that, amazing. I only used those colours for wood because they are the darkest colours I could find that didn't look ridiculous in wood, And I don't really want my stone things to be bright blue or anything. Yes it is... For that reason, I have chosen these specific colours to provide a challenge and bring out the creative side of the texturers'. I do agree with what you are saying, but this is a challenge; therefor, there must be some way of giving one... Thankyou for the input though! I am not joining but here is dirt and grass in this palette. I think they look acceptable. I think they look quite nice actually!